February was an important month for GHS and the Rights Respecting School Award. On Tuesday the 20th of February we invited two UNICEF assessors to come in to the school to decided whether or not we have done enough to be awarded our Gold (Level 2) Rights Respecting School Award. The assessment day was extremely positive and we would like to thanks all of the pupils, staff, parents and partner agencies that were involved. It was really great to see how far we have come on our RRSA journey and to be able to celebrate the work that we have done. It will still be a couple of weeks until we find out if we have achieved the Gold award, but if we do then we will be the first school in our local authority to do so. This is really something to be proud of and it makes all of the hard work worth while. This ia going to be a BIG term for GHS and the Rights Respecting School Award. On Monday 22nd of January we are holding a Holocaust Memorial Service in the evening at the school with a number of visiting speakers. On the 24th of January we have a number of visitors coming from UNICEF and the Scottish Government to see how we are driving Children's Rights forward at GHS and then on February 20th we have our Gold (Level 2) assessment! WE Advocacy – A group of pupils have become involved with the WE group. The concept is that it may be difficult to change the world on you own as I...but a group of people will feel stronger and more confident as WE, working together. 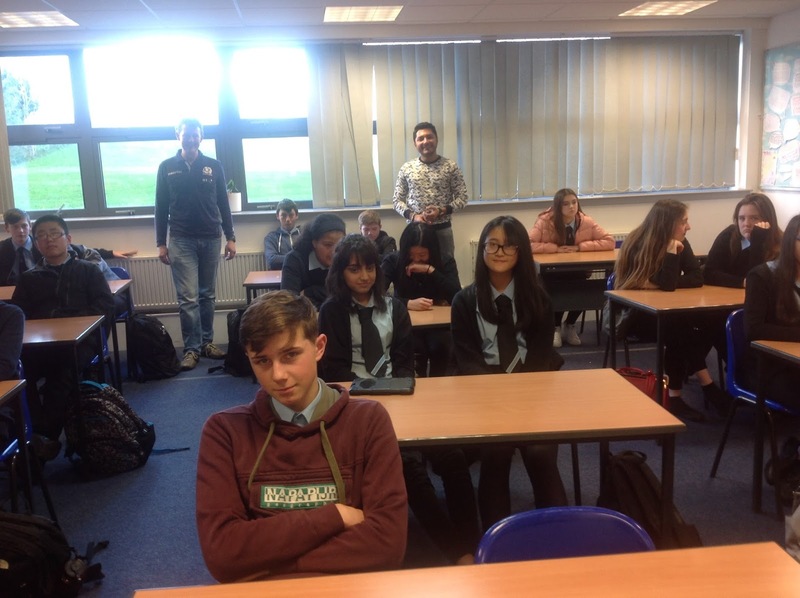 One pupil has already travelled to India to build a school during the summer holidays, and the full We group are campaigning in school for staff and pupils to be more aware of mental health issues. We were lucky enough to hold the WE annual conference at the school and representatives from all over Scotland attended. Rights Campaigns – we were lucky enough to have a number of Human Rights speakers come into the school this session and after each event we made sure that we followed up with some sort of advocacy work. One such campaign was an excellent poster campaign on the rights of refugees and the right to choose your own religion after a talk from Amirata, a refugee who had to flee Iran after converting to Christianity. The posters were designed and then put up in the local community to teach others about rights. Campaigning for Change – The RME department have been heavily involved in campaigning for change on a number of issues this year. Two of the best examples were when they firstly got a full year group to write letters to the PE department to ask them to start using fair trade “Bala Balls” and secondly when another set of pupils wrote letters to Nestle to protest their sales of baby milk in Africa. Charity Work – The charity committee has completed a lot of great work this year and taken Article 12 into account when doing so. Pupils were all asked to vote on the charity of the year and we selected Autism Scotland as our main charity. Article 24 was used as one of the reasons to choose this charity and a number of different events have taken place to raise money. 1 in 5 and Global Goal of No Poverty – The brand new 1 in 5 group was formed in the school and then from this the opportunities fund was formed too. This is a fund that pupils can access if they can’t afford various things at school such as uniform or trips. We have also chosen No Poverty as the schools Global Goal to focus on this year. Pupils have really gotten involved and have been selling “pre-loved” uniforms at parent’s evenings. Pupils have also been involved in choosing what we should spend some of the opportunities fund on throughout the year. Ogwini – The Ogwini trip is an established part of GHS life and it takes place every two year. During the last trip pupils took over rights lessons to teach to the pupils in Ogwini and educate them on their rights. Mini lessons took place in Ogwini and the pupils were introduced to the UNCRC and its importance. When it was found that the pupils there did not have clean water money was raised by pupils at GHS to help them repair their water tower. Sponsored Walk – As part of the new opportunities fund the pupils of the school decided to stage a whole school sponsored walk. This was a massive success and almost all pupils attended. The school raised over £1500, half of the money will go the charity of the year and the other half will go straight into the opportunities fund. This will feed directly into our Global Goal of No Poverty. Food Bank Campaign – The Gracemount Give Back Food Campaign has become an annual fixture at GHS. This is a food collection for The Local Trussell Trust Foodbank and it is run by S6 RRSA volunteers each year. 2017 was the most successful year so far after the pupils created a poster campaign to advertise this to pupils and staff. RRSA Pupil Group Lesson to P7 Pupils – The RRSA pupil group have been involved in a lot of advocacy work this year and one of the initiatives was to create a lesson to teach P7 pupils at the local primary school about Human Rights, the UNCRC and the RRSA. This lesson was well planned by the group and really well presented. The primary have not yet started their RRSA journey so this was a great starting point. RRSA pupil group Rights Video – The RRSA pupil group wanted to educate others on rights and thought that a really effective way of doing this would be to make a rights video. This was written with the help of staff and then filmed by a S6 volunteer and a number of pupils from each year group. The result was excellent and the video has since been used to educate our new S1 pupils on the UNCRC and also the local primary pupils. As well as that the video was used when a practitioners training session took place at GHS for other people on their RRSA journey. LGBT Group – The LGBT group have been one of the most active rights campaigners in Gracemount. Each year they have a focus around LGBT History Month where they present to the whole school in assembly and then create some form of campaign. In 2017 they carried out a poster campaign looking at famous LGBT people from history and then in 2018 they have made a push to help people come out as LGBT using Rugby star Gareth Thomas’ story to inspire pupils. I am sure that you will agree that this is an amazing amount of work and all the pupils and staff involved have made a real impact on the rights of others. It has been another busy month for the Rights Respecting School Award at GHS. 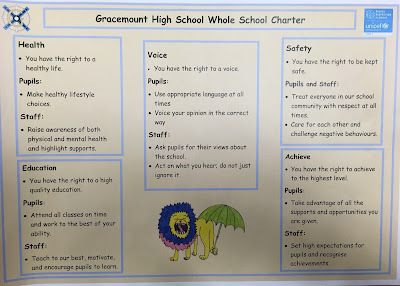 This month our S6 volunteers have worked very closely with our SfL department to create a brand new Inclusive Whole School Charter that can be accessed by all of our school community. See the new charter below. We have also finalised our curriculum tracker that allows us to see where we are teaching about the UNCRC and Human Rights in lessons throughout the year. We are doing a lot of great work over all of our faculties and it is great to see everyone getting involved. Next year will be an even bigger year for the RRSA at GHS so keep an eye on this page and the twitter account to keep up to date. Respect Week 2017 - 13th-17th November. Respect Week 2017 takes place between 13th and 17th of November. This is also National Anti-Bullying across the country and we are linking the two. Respect Week is a chance for us to celebrate everything that we have achieved as a school and to promote mutual respect between all of our school partners. The pupil and staff RRSA group decided to theme this years respect week as "Respect Yourself" and look at how we can promote positive mental health. We are also going to look at the link between bullying and mental health issues and how we can tackle them. We are also going to launch a brand new anti-bullying policy to all staff, pupils and parents next week and this will be introduced through PSE. We have had a really busy start to the year at Gracemount High School with all the excellent work that has been going on linked to the Rights Respecting School Award. 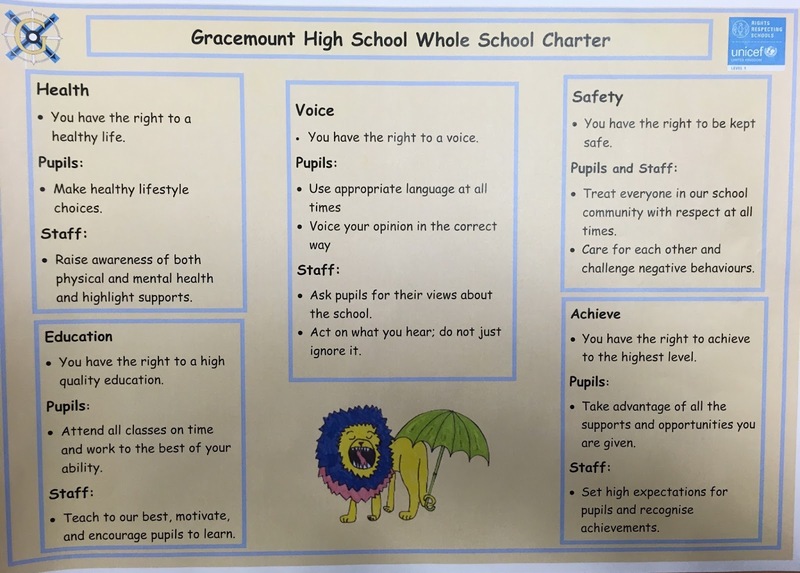 Both the pupils group and staff group have been working hard to promote rights and the UNCRC to all members of our school community and the pupil group are even going out to teach lessons on rights to pupils at Gracemount Primary School. As well as all this great work a number of great events have taken place in the school in recent weeks. We had the Parent Open Evening 2017 where parents had the chance to learn about the RRSA and the work that we have been doing and we have held a number of workshops for pupils such as the one pictured above. Amirata is a Turkish refugee who visited the school to talk about the importance of being able to choose your own religions and beliefs. Pupils are going to use this as a starting point to educated people in this right and complete a poster campaign for the local community.